Before I left on my expedition to the South Pole I got a lot of advice from people. Biking to the South Pole is a seemingly impossible task. I assume these people were honestly concerned about my welfare. This is part one of nine posts looking at some of the advice I was given. Alan wrote this in the cover of the book Endurance: Shackleton's Incredible Voyage, a story about the Imperial Trans-Antarctic Expedition led by Sir Ernest H Shackleton. The expedition attempted to cross the Antarctic content. 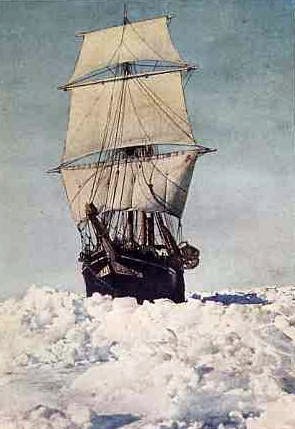 During the expedition, the ship Endurance was trapped in the pack ice of the Weddell Sea. The ship was crushed by the ice and the men spent about a year floating on the ice before landing on Elephant Island. Eventually Shackleton was able to cross the Drake Passage and reach South Georgia Island. Amazingly everyone on the expedition survived this miraculous journey. The book is commonly considered the greatest adventure story of all time. I'm sure Alan gave me this book figuring that I would read it and see how crazy the idea of biking to the South Pole was. But the book had the opposite effect on me. Time after time it seemed that Shackleton and his men were all about to die, and just when all hope seemed lost, a miracle would occur. One of these was when they were low on food and fuel needed to cook the food and to melt ice for water to drink. Then a leopard seal jumped out of the water to eat one of the crew members. The leopard seal was shot. The blubber provided needed fuel, and the meat provided needed food. I read about the extreme cold and hardships, but they always overcame the challenges. I realized that my expedition was going to be harder and more challenging than I could possibly imagine, but I felt that, like Shackleton and his men, somehow I would be able to overcome the challenges I would face. It would require a lot of preparation, and it would require that I have the mental toughness to continue on. Like my expedition, this life will be harder and more challenging than you can possibly imagine, but you can rise to conquer the challenges. If you endure and put forth the effort, in the end you will succeed.